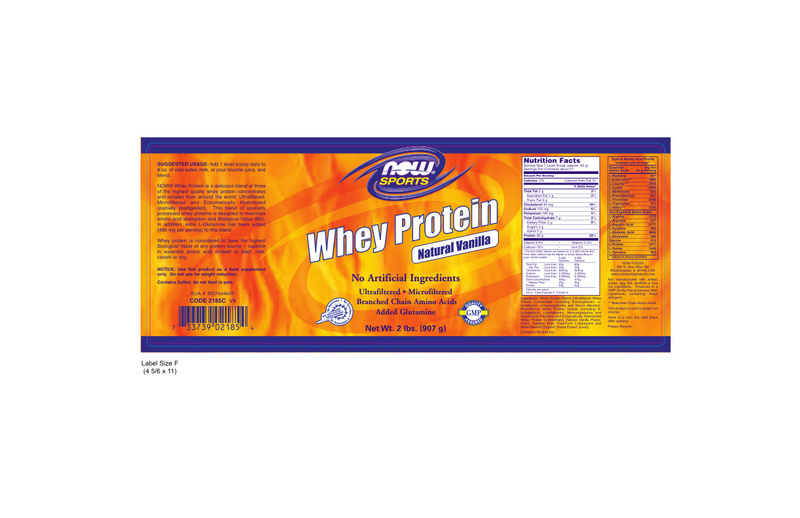 NOW® Whey Protein is a delicious blend of three of the highest quality whey protein concentrates and isolates from around the world: Ultrafiltered, Microfiltered and Enzymatically Hydrolyzed (partially predigested). This blend of specially processed whey proteins is designed to maximize amino acid absorption and Biological Value (BV). In addition, extra L-Glutamine has been added (460 mg per serving) to this blend. Whey protein is considered to have the highest Biological Value of any protein source – superior in essential amino acid content to beef, milk, casein or soy. This product is sold by weight not volume. Add 1 level scoop (43 g) daily to 8 oz. of cold water, milk, or your favorite juice, and blend. Store in a cool, dry place after opening. Whey Protein Blend [Ultrafiltered Whey Protein Concentrate, Microfiltered Whey Protein Isolate and Enzymatically Hydrolyzed Whey Protein Concentrate], Natural Vanilla Flavor, Xylitol, Xanthan Gum, Free-Form L-Glutamine and BetterStevia [Organic Stevia Extract (Leaf)]. Contains milk and soy. Use this product as a food supplement only. Do not use for weight reduction. Contains Xylitol, do not feed to pets.